Being a musician for most of my life, piano lessons from an early age, percussion in elementary thru high school, college jazz band, and then teaching myself guitar and bass in my teenage years, along with teenage dreams of Rock Stardom with some high school buddies as we formed a local band at the end of highschool, I love playing music. It is my passion. The Police were huge in the early 80's when I was first starting to get into bands, learning about them from friends, MTV, etc, and then Sting's solo work towards the end of my high school career, I was/am a huge fan. In the late summer, early fall of 1996, I was lucky enough to get 4th row center for the Mercury Falling tour as it came through Phoenix. 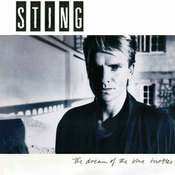 As luck would have it, I was listening to a local radio station driving home from work one night and heard a Sting song. The DJ then announced Sting was on Leno that night. Being a music dork and one hobby was taping and keeping my favorite music act's performances on talk shows, music vids on MTV, etc, I went home and got my VCR ready! He performed I'm So Happy I Can't Stop Crying for the show. Then came the interview. Leno questioned him about pulling people up on stage to sing the song with him and told the story of how that came to be. Well, I thought to myself, I've got good tickets, I'll make a sign to try and get on stage. Then I thought, hmmm, how do I get picked over what was going to obviously be many many other people with signs. It then hit me. I play bass. Sting plays bass. Maybe I can get him to let me play the bass and/or sing. So I learned the live version they just played since I taped it, made a sign, took it to the show and held it up during points when the lights were on the crowd and he finally read it. I could see him squinting his eyes reading it. He then shook his head as if to say, what a nutball. Then tragedy ensued. Some dumbass security guy came and took my sign away from me because he said I was not allowed to have it. Um, don't know why they let me in with it if that was so. But luckily he had seen it already. Well, the time came to pick a person to come up and sing the song with him. I was so pissed I didn't have my sign anymore, and he picked someone else to sing. I kept after him though to at least play the bass along with my wife at the time. Well the persistance paid off. He announced to the crowd. "There's a guy that wants to play bass on this song." The other guy reached the stage and Sting started banter with him. He then turned and looked at me. He said "Are you the bass player? Come on then..." I raced up to the stage as Sting continued talking to the first lucky fan. I came up and stood there waiting my turn. He turned to me and said "Hello, what's your name?" "Michael" I replied. "Do you want to play the bass?" "Yes please". He said "Alright" and handed me his bass...the one pictured above here actually. 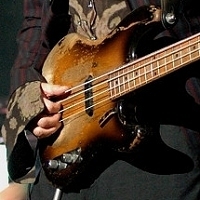 (I also just recently bought a reproduction model of that bass that Fender makes in their Artist Signature Series). The crowd went nuts. He made sure I knew what key it was in and off we went. I started the song and forgot about the crowd. I just didn't want to screw up in front of Sting. When the song was over. He kicked the other guy off and then turned to me and I handed him back his bass. He gave me a hug and told me to "now GET OFF MY STAGE!" I ran and shook Kenny Kirkland's hand, went to the front of the stage and raised both of my hands in victory. The crowd gave me a big cheer. I went back to my seat and sat down drained. My wife was going crazy, along with my sister, father and close friend, who were all there to witness the event. When the show ended, I went to the foot of the stage and asked for a setlist. One of the crew recognized me and said, "Oh you're the guy that played the bass, yea, here ya go." and gave me Dominic's set list from the stage. We then took a chance where Sting would be staying for the night and drove to the Ritz Carlton. As my wife and I and friend walked in, a woman saw me and said "Oh hey, you're the guy that played bass tonight!" I asked her "Is he here?" She said, "yep, he's in the bar". I walked into the bar and there he was with some of the band having some drinks. He recognized me immediately. I asked if he would sign the set list, which of course he did and where it said "Happy", he wrote "Mike on Bass" and signed it. I had him sign the Mercury Falling CD cover as well. He asked how long I'd been playing, I told him, music most of my life, the bass, about 10 years. The other guys in the band all shook my hand and we left. AGAIN as luck would have it, a local news crew was at the show filming some of the show to air on the late news, the footage they showed was when I was on stage! So I got to record the rebroadcast of the news at 2am and got about 20 seconds of the whole thing. Look it up on youtube! The video is called "I'm so happy I can't stop crying Playing with sting 96" So that's my story, hope you enjoyed it, and look up my video on youtube. I have a few unforgettable moments with Sting. My friend Kelly and I went to see him in Toronto oh about 20 years ago (had floors too - which is next to impossible to get nowadays). For his encore song, he asked the audience what they wanted to hear. Everyone in unison yelled "Roxanne" except Kelly and I. We yelled out "Fragile", he looked at us, smiled and played "Fragile". This then became his encore song from then on in :D I also saw him a few years later when he played at Kingswood Music Theatre inside Canada's Wonderland (had second row)and Domenic played right in front of me asking "Do you like it"? I also met Sting when I was 19 and he was at a book signing in Toronto. I bawled like a baby... hyperventilating and everything! He asked me if I was okay, put his arm around me and kissed me - I thought I'd die! He's going to be playing at Massey Hall in Toronto on November 1st and I'm trying desperately to win tickets for it, so that I can bring my 8 year old son to it with me! He's a second generation Sting/Police lover...Like he had a choice!!! I nver thought I could see Sting alive from a very short distance, as I stood on the first row in Jakarta Convention Center with my brother. Ten Summoner's Tales Tour. IT was a memorable day for me and my brother. The metal barrier in the hall was new painted and I got all the stain on my jeans. But never mind, it was the souvenir. On the following day he and his crew flew by Singapore Airlines where I once worked, but I could only see his crew. 10 years later (Sting didn't performance in Indonesia since then), I went to his concert in Zürich, I was pregnant but I wanted to go to Sting's concert. Well, I liked the one in Jakarta much better, it was somehow for me more emotional and thrill, as it was really an experience. I pretty much eagerly want to go the one in Beacon Theatre NYC (I live in NJ now), but the ticket is away too expensive for me. Ok ,so I know this is a STING concert question...and I did post that... But this is really cool too... During The Police Reunion Tour...My Husband and I were about to have our 15th Wedding Anniversary. I wanted to go SO bad, but we were having a financially challenging year. It didn't even seem possible. However, my Husband is fantastic..and suggested we go, that he had been saving up,and that it would be my 15th Anniversary present!! :) Whoo Hoo!! I was happy to go no matter where we sat, and assumed we would be very far away from the stage. But lo and behold...he got us floor seats!! It was my 15th Wedding Anniversary Present :) The AWESOME thing was, the concert...was ON OUR ANNIVERSARY DAY!!!!!! We were able to celebrate with Sting, and hear all the songs in concert that I was never able to when I was a kid :) AWESOME!!!!!!!!!!!!! LOVE my Husband!! In February 1985, I turned 20. I was a student in Paris. A good friend of mine offered me an enveloppe as a birthday present and with a smile said “Here, for your birthday I offer to you... : Sting flesh and bones.” In the enveloppe there were two tickets for a concert in Théâtre Mogador in Paris. It was one of the best surprised birthday gift ever. I love his voice when he sings. I do not like when he talks because he sounds like a regular british guy and it breaks the magic. But... when he sings... something happens, his voice changes and moves me, guts and soul. Only few singers have this effect on me. He is one of them. I had to wait from February to May 25th. The waiting time made the experience more exciting. I was keeping the tickets in a safe place and sometime I would look at it and smile. When I sat at the balcony, right in the middle, facing the stage, I forgot all the people around, there were only my friend and I wainting for my 20 years birthday gift. I remember the stairs on the stage and the lights on the stairs. I loved the lights. I don't know who took care of the lights for this concert, but this person did a great job. A sort of fire works matching well with the music. The musicians were great. Sting knows how to choose great musicans to play with. I loved "Shadows in the Rain". So much energy, all the musicans sounded great. I had heard Kenny Kirkland before but I didn't know yet Branford Marsalis, Omar Hakim. My favorite song was "Consider Me Gone". It was a great band. It was a great 20 years birthday concert for me. Thank you to Nadia for this present. Thank you to Sting to have sung for my birthday. I still have this ticket inside a book of Victor Hugo's poetry. Dragged by my friends in high school to see some band in Poughkeepsie NY. Wanted to stay home and watch the NY Giants Playoff game on TV. Wish I'd watched more of the band and less of the game on TV, lol. I won VIP pack and had the chance to see the 3 Policemen playing Next to you for my wife and I alone in the Stade the France 3 hours before the concert beggins... And the dream came true!! We met Joe (Fiction Plane) but were a little fustrated not meeting closely Andy, Stew or Sting. I'll take my chance another time ! My first Sting concert I had ever got the chance to go to was in Budapest, Hungary 2010. I had booked my ticket four months prior to the concert. I was so excited, I couldn't wait to see Sting to perform with London's Royal Philharmonic Orchestra. Being a great fan of classical music as well it was for me as if a dream had come true. However, quite unexpectedly I had to travel to Istanbul for a week and I wasn't due to return to Hungary till the very day of the concert. Hadn't it been for the 9-hour delay at the airport in Istanbul, I could have had still the chance to arrive to the concert on time. But it wasn't the case. I was angry and sad and disappointed, particularly because this concert was one of the very few things which could cheer me up during my quite hard and challenging visit to Turkey. But I didn't give up. After arriving at the airport I rushed to the venue of the concert, to the Papp László Sportaréna. I was exhausted and extremely late: more than an hour. I had to beg the assistants at the entry gate to let me in. But finally, I was there. Sitting in a row at the back, far away from the stage. But still: never in my life had I been closer to a stage before. Because Sting and Jo Lawry were singing a song I had been adoring since the first time I had heard it in the movie Cold Mountain. A song called 'You Will Be My Ain True Love' written and 'co-performed' by Sting himself. I was mesmerized and this feeling lasted even for days after the concert. Thank you, thank you so much. The concert was held outside the Sydney Opera House in February 2011 on the Symphonicity tour. My wife and I were 10 rows back from the stage right in the centre. It was a gorgeous warm and breathless night. I felt as though Sting was performing just for us. It was an amazing night of wonderful music and stories. A night I will never forget! So very hard to choose a favourite concert moment..As they are all unique in their own way... and special as I have made alot of dear friends and sharing the experience with them just makes the concert experience so very much more enjoyable. I think one of my favourite moments was during the police tour in 2007 Toronto, Front Row at the ACC. That is when Sting and I shared a little moment during walking on the moon, he stood and played right in front of me..something I will never forget. Sting has appeared with the Royal Philharmonic Concert Orchestra at the Lanxess Arena. I ordered the tickets very early for me and my husband. We had a very good view of the stage and were the actions (especially the conductor Steven Mercurio) survey of the entire orchestra. Super were the dance numbers by Jo Lawry, Dominic Miller, Sting. But the best of the solo vocals by Sting was the end. "I Was Brought To My Senses". His pure, unique voice without hearing instruments. Simply brilliant, as the time was ripe to join the fan club!! Join Sting.com as we celebrate the 25th anniversary of Sting's enduring solo career with the "25 Days" countdown! 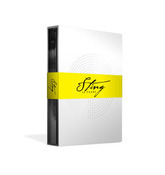 In the weeks leading up to the release of Sting: 25 Years, the definitive box set collection, and Sting's 60th birthday, please visit Sting.com at 11AM/EST each day for detailed instructions on how to enter trivia contests, access exclusive audio and video content and much more. Throughout the countdown, fans can enter to win extraordinary prizes, including autographed items by Sting. The grand prize - an autographed, one-of-a-kind Fender Sting Precision Bass Guitar - will be awarded to one lucky winner!